One of our speciality is Creative Writing & Punch Lines into Hindi Language. A well written creative abstract or punch line for your business or product can certainly attract more numbers of customers. Our customers can avail from us, Creative Writing Service. 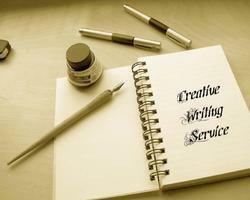 These services are completed by creative writer who have rich industry skill and experience. We select our writer via strict test and interviews. We are offering these services to our clients at low prices. This course provides a link between vocabulary and imagination. Students, who are chained with a set vocabulary, sound repetitive and boring. Creative writing gives them wings to spread and they develop a skill that lasts for a lifetime. Creative writing helps a student to learn the way of communicating his thoughts in a literary way. The content of Essays, Poems and Slogans are directly related to a student's perspective about a particular topic and helps him in learning ways to represent his ideas. School authorities provide such task as holiday homework assignment to help them learn unique ways of expressing their interests. Detailed study of all the parts of speech. Comprehension through passages. The Sentence: Detailed study of different kinds of sentences. ♦ Progression of the story towards climax through imagination and creativity. Content that's well written and influential can be very personal and effective. It can convey a wealth of information about you, your services, and your products. GANESHAM Software provides unique and affordable creative writing services. Rajat Ailawadi do knows how to write creative slogans and content. He is new but sobre. You can take his advice or help, for a fee. Theres something to be said about having your marketing materials and company communications written by people that have a way with wordsits a good idea!